From 25th March to 3rd April 2000, Bangkok hosted the World Youth Stamp Exhibition and the 13th Asian International Stamp Exhibition. To commemorate its participation at these meetings, Pos Indonesia issued on March 23, 2000 a special souvenir sheet depicting the King Dragon (Naga Raja in Sanskrit) flying. The logo of these events is also present on the upper right hand side of the sheet. A big thank you to Irene for this nice cover! 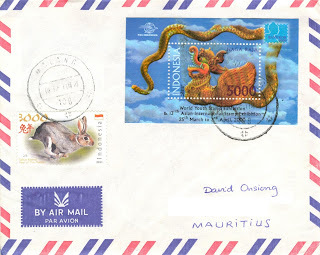 :) She completed her postage with a stamp from the Year of the Rabbit set issued at the beginning of the year and which I've already talked about in a previous post.